Precious metals futures settled lower Monday in exceptionally low-volume trading. Losses ranged from 0.4% for platinum to 3.4% for silver. Gold for February delivery gave back on Monday exactly what it gained on Thursday, $7.60 or 0.7%. Prices settled at $1,068.30 an ounce on the Comex division of the New York Mercantile Exchange. "The drop in oil prices overnight has reasserted some pressure on the gold and silver markets and although a softer tone may be expected this week, the metals should remain in a relatively tight range as the world gets ready to ring in 2016," said Peter Hug, global trading director, at Kitco Metals. 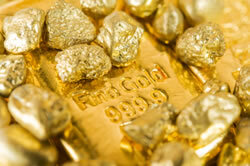 Gold prices traded from a low of $1,065.70 to a high of $1,076.50. They advanced 1% last week, their first weekly gain in three weeks. Silver for March delivery tumbled 49.5 cents to settle at $13.884 an ounce. Silver prices ranged from $13.85 to $14.43. They surged last week by 2%. January platinum fell $3.40 to $880.80 an ounce, trading between $874.80 and $896. Palladium for March delivery declined $7.30, or 1.3%, to $551.95 an ounce, ranging from $551.10 and $564.90. Last week, platinum gained 2.7% and palladium edged up 0.1%. Gold at $1,071.90 an ounce. Silver at $14.20 an ounce. Platinum at $874 an ounce. Palladium at $554 an ounce. As for last week, gains included 0.9% for gold, 2.7% for silver, 2.6% for platinum and 0.2% for palladium. United States Mint bullion sales were unchanged Monday as of 3:40 p.m. ET. Below is a listing of U.S. Mint bullion products with the number of coins sold during varying periods. Products with an asterisk (*) are no longer available.